christytomlinson: Hello, Welcome and whats NEW! Hello friend, and welcome to my website! So glad you found me and so happy to have you here! TWO brand New kits have been added to the Planner Society Line up! Our Brand New Box Sticker Sub and our Washi Tape Sub! Simply Click on the link Below for more info! Next! 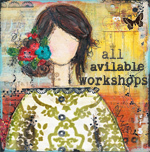 I have a BRAND NEW ONLINE WORKSHOP! 8 AMAZING teachers joining me!! SOO Much fun and class starts SOON! It's online and all pre-recorded videos, so you can watch it ANYTIME from ANYWHERE! OR simply just have a look around! Links to my Etsy Shop (where I sell digital art prints and planner planning pages), My Youtube channel, My Scarlet lime Shoppe (where we sell oodles of fun things for your planner and mixed media projects), My Retreats, OR my other 30 PLUS Online Artsy & Planner workshops, simply click on the links above in the header, or the right on the side bar! Always lots of fun things happened here!